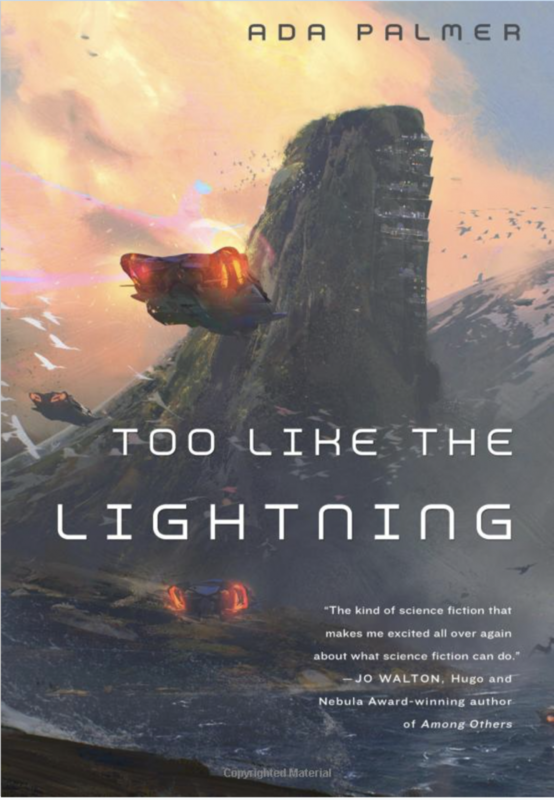 Ada Palmer’s Too Like the Lightning is finally out (Powells, Amazon), so that you can read it too (I’ve been impatiently waiting to share it with everyone I know). As Jo Walton says here, it’s wonderful. It does something that I think is genuinely new (or at least, if other people have pulled it off, I haven’t read them). Palmer is a historian (here’s an interview I did with her on her book about Lucretius’ reception in the Renaissance) and approaches science fiction in a novel way. Her 25th century draws on the ideas of Enlightenment humanism, but in the same ways that, say, America draws on the writers of the Declaration of Independence and the Federalist Papers. Which is to say that it takes the bits that seem useful, reinterpret them or misinterpret them as new circumstances dictate, and graft them onto what is already there, throwing away the rest. Palmer does this quite thoroughly and comprehensively – her imagined society is both thrown together in the way that real societies are, and clinker-built (in the sense that she has evidently really thought through how this would be related to that and what it might mean). This allows her to pull off a wonderful conjuring trick. The difficult part (as I see it as a reader) of writing really good science fiction is that you need to make your society and your story strange enough to alienate and to provoke that sense of wonder, but familiar enough to be comprehensible. Palmer does this in an entirely novel way. Her imagined society misremembers and misinterprets the Enlightenment as does ours; it puts Enlightenment ideas to its own uses. These twin acts of misinterpretation are what create the bridge between the reader and a 25th century that is thoroughly unlike her own – it is the radically different uses of the Enlightenment that both make this future seem comprehensible and make it seem so dazzlingly strange. Again and again, her world seems familiar, when the reader encounters some scrap of an idea, or social practice or argument that builds on thinkers whom we think we know. But again and again, the rug is yanked away from beneath the reader as she realizes that no – this isn’t what it looked like at first glance, or that it is, but that it fits very differently because it has been cut to match the needs of a different world. The reader is looking into a mirror of misprisions. Too Like the Lightning is an Enlightenment book, but one that takes and radicalizes the lesson of a Romantic writer – to make the strange familiar and the familiar strange. It’s quite a common experience when you’re a teenager to read a book that blows you away, that causes the top of your head to come off and your brain to rearrange itself and be a better more interesting brain thereafter. I’ve talked about this a lot, both in posts here and also fictionally in Among Others, it’s one of the fundamental experiences of the SF reading kid. It’s a much less common experience when you’re grown up. I read books now and I think “Oh I like this! This is a really great example of that thing”. I may get immersed in a book and hyperventilate but I won’t finish a book and think “Wait, who am I? Why is the world like this? Do I even have a head?” This did that to me, it gave me that experience of reading SF when SF was new to me, the feeling that I am a different and better person because I read this, and not only that but a better and more ambitious writer. She quotes other writers who came away with the same feeling (I did too, as a reader). This book has the capacity to fundamentally remake the genre. If you think that you at all might like it, you should read it.